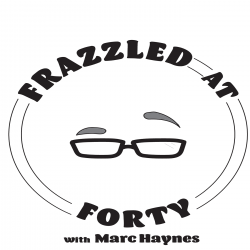 Journey with blogger Marc Haynes as he navigates his forties and beyond with the Frazzled at Forty Podcast. Marc explores where he is from and where he is going in life. Often amazed he has made it into adulthood, Marc covers various topics from childhood to the present, family, home, food and drink, society and culture. With a bit of wit and sarcasm, Marc’s commentary on topics will leave you either laughing, commiserating on life’s experiences, or wondering like him, how we are just getting through it all. Marc touches on a couple subjects including being a good Samaritan and an ethical dilemma which he faced this past week. He then dives into the meat of this podcast, PETS! This post is dedicated to Bernie the Skunk who was the best pet ever to good friends Gaylene and Dave!